“Like most hairdressers, I’m a little artistic. I love color and often painted and sketched while growing up. My grandmother recognized I was always playing with hairstyles on myself and friends and that I might be happier in a more artistic field and suggested I try hair. My first salon job was at Pierre Michel as an assistant where I worked and studied to do hair color with the likes of Danilo. They put me on the floor and I began building a small clientele. From there I went to John Frieda where I began to build a large clientele and celebrities. Then Bumble and Bumble and Sally Hershberger before developing a partnership with hairdresser Abell and opening a salon of my own. I feel very lucky to be in an industry that makes women and men feel good about their appearance. We all have something about ourselves we don’t love or maybe not appreciate. Make-up can transform anyone but I mostly love it to show my own moods. I like more natural looking make-up daily as my hair color is already a statement. I feel prettiest with pink blush on and a bright pink lip. There’s something about rosy cheeks that I think compliments everyone and makes them look healthy even if they’re feeling under the weather. Lipstick is usually hot pink NARS Schiap or a red coral color from By-Poppy Lipstick Queen called Medieval. My NARS Shiap lipstick was a color I bought at Jeffrey’s in Meatpacking. I was just on hunt to find another bright pink to replace my MAC Moxy that had been discontinued. Poppy, who owns My-Poppy, is a long time client of my salon colorist, Bryan. She will bring little treats for the girls at the salon to try new colors. I never was a fan of reds until I tried hers. The tones are beautifully balanced that I think anyone who thinks they can’t red, could wear one of hers. I love hot pink or red lipstick contrast with my hair color as it’s really colorless. It makes everything look perky and more put together, especially when I wear more casual clothes such as a white T-shirt and jeans. 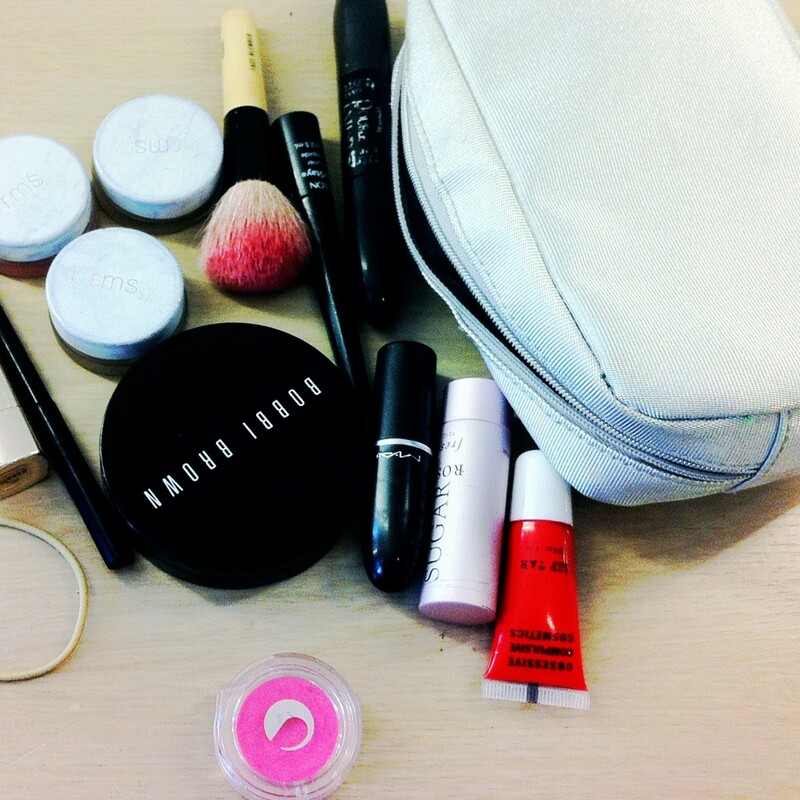 My favorite must-have is RMS Beauty. It’s a natural cream organic line from make-up artist Rose-Marie Swift. I originally met Rose-Marie Swift through a hairdresser friend. She is a make-up artist that works regularly with Gisele, Adriana Lima and many other Victoria’s Secret models. She had sensitivity issues with beauty products as her clients and I do and wanted to find a more naturally derived make-up. I bought her products several years ago and have been a loyal user ever since. I have a lot of sensitivity to make-up and moisturizers so the least ingredients or more natural the better for my skin. I use RMS “Un” Cover-Up for blemishes, RMS Living Luminizer for eyelids and cheek bones to highlight and RMS Lip2Cheek in Smile for blush. One trick I love is with the RMS Living Luminizer. Rose Marie told me to dab a little on the top of my lip and at bottom lip after my lipstick application to make them look more plump. You can also add to upper cheek bones and under brows to create lift to facial structure. Mascara is always the drugstore brands. I love L’Oreal Double Extend for big goop-ie eye lashes. When I’m feeling frisky I use black eye liner, I love Maybelline Master Drama in Midnight Master. It’s SO Black. When I decide to wear black eyeliner its because I want my eye color to pop a bit more, as they are hazel in color. I usually do that for drama if I’m going out for the night with lots of mascara. I usually pick this for evening make-up so I don’t have deal with my wearing off pink or red lips at dinner or drinks. –Marie Robinson of the Marie Robinson Salon @mariesalon. Marie’s extensive celebrity clients include Anne Hathaway, Jennifer Connelly, Emma Stone and Michelle Williams.